Arsenal put in a gritty display to hold out to high flying Southampton and seal 3 points in a weekend of Premier League football filled with surprises. With Liverpool requiring a late Daniel Sturridge goal to rescue a point at Everton, and Manchester United being held to a draw later on in Cardiff, and oh, Sp*rs getting mauled 6-0 by Manchester City (HAHA! ), 3 points look like a premium. Well, it was a deserved premium in the end. Jack Wilshere returned to the starting lineup in place of the suspended Mathieu Flamini, while Theo Walcott returned to the bench after his long recovery from a niggling injury. Southampton started brightly, and showed how well drilled a unit they have become under the management of Mauricio Pochettino, closing down on every ball. Arsenal had the first chance of the game, when Jack Wilshere was released by the Ramsey-Giroud combo on the right, but his delightful chip over Polish international keeper Artur Boruc struck the outside of the far post. Boruc scrambled the ball to safety. Arsenal were denied moments later, when Mesut Ozil spotted Aaron Ramsey in the box, but the same post came to the Saint’s resuce again, as his clever backheel could only strike the outside of the woodwork. The Gunners didn’t have to wait longer. Goalkeepers are a crazy bunch they say, and Boruc proved it with his eccentric moment of madness. With the ball at his feet, and Giroud for close comfort, the Pole had plenty of time to pass the ball into safety, but instead decided to take the French striker on. He succeeded twice, but Giroud persisted. Boruc fell laughably on his back, giving Giroud the simplest of tap ins. After the goal, Arsenal were happy to sit back and invite Southampton pressure. Wojciech Szczesny came to the rescue of Arsenal, as a Mikel Arteta clearance was completely miscued. Southampton enjoyed a good period of possession, as Arsenal looked sloppy in midfield, but with little danger. Victor Wanyama was becoming a pain to Arsenal’s midfield, with his robust style, and got away several times, but was eventually booked early in the second half for a foul on Santi Cazorla. Southampton worked on a patient passing buildup before an Adam Lallana shot failed to test Szczesny. Arsenal were stuttering in their search for a decisive second goal, despite some good chances. Giroud was called offside a couple of times, and Southampton managed to get an odd boot in between to avert danger. Mesut Ozil saw his shot saved easily by Boruc, who was beeing cheered everytime he got the ball. On one ocassion, his clearance comically went into the crowd, off Nathaniel Clyne, under no pressure whatsoever. Theo Walcott replaced Santi Cazorla in the 69th minute, before Mikel Arteta worryingly hobbled off to be replaced by Tomas Rosicky. Southampton then created a flurry of chances. 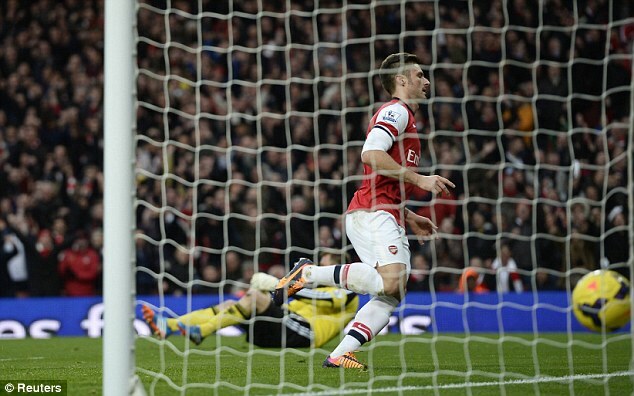 First, Ricky Lambert’s shot deflected off Kieran Gibbs, with Szczesny completely out of position. Wanyama saw his header glide narrowly over the bar, before Jay Rodriguez made a darting run, leaving Per Mertesacker and Bacary Sagna way behind, only to be brilliantly tackled by Laurent Koscielny. Nacho Monreal made his customary appearance, replacing Mesut Ozil. Walcott then saw his shot whiz wide of the Southampton post. Arsenal sealed the game in the 86th minute, when Jose Fonte pulled at Per Mertesacker’s shirt when Arsenal were contesting a corner, and the Gunners were awarded a penalty. With Mikel Arteta already substituted, Giroud stepped up and converted to seal a 2-0 win. A positive win in all aspects. Arsenal weren’t fluent, but grinded out a win against a side that had won at Anfield and picked a point at Old Trafford. Arsenal face Cardiff away and Hull at home next, as they look to capitalize on the 4 point lead over Liverpool at the top of the table, but before that a Champions League home clash against Marseille.